Motorola has applied for a patent on a microphone, transceiver and power supply built into a patch designed to be stuck to a consumer’s neck. The idea is that the electronic tattoo would directly capture sound “emanating from a throat” and transmit it to a smartphone or other computing device via Bluetooth, NFC or other wireless protocols. The patch is intended to provide auxiliary voice input to a mobile computing device, and the company suggests it could be useful in noisy environments such as stadiums, busy streets, restaurants and emergency situations. 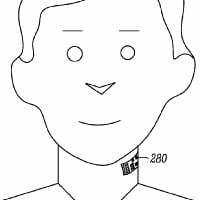 The device, described throughout the patent application as an “electronic skin tattoo”, could also be embedded in a collar or a band worn around the throat. This is the most bizarre NFC news I’ve ever read.